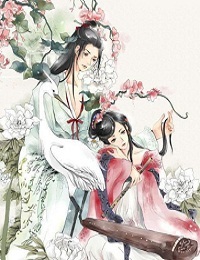 The Chinese of this Chinese Story "The Old Man Under the Moon--Yue Xia Lao Ren" is 月下老人 and Pin Yin yuè xià lǎo rén. One year, when he traveled to Song city, a friend suggested that he would introduce him to the daughter of the deputy mayor of the Qing He County and made an appointment with him at the forecourt of Lung Xing Temple (龙兴寺) at daybreak next morning. Wei Gu was very anxious and woke up far before daybreak. When he arrived at the temple, nobody was there but an old man with snowy hair and beard leaning against a large cloth bag, sitting on the step, and reading a thick book in the bright moonlight. Curious about what he is reading, Wei Gu approached the old man and took a look at the book, but to his surprise, he could not know a single character on it. "It is a Heavenly Book. How can you read it?" the old man replied with a smile. "Really? what is it about?" Overjoyed at what he heard, Wei Gu wasted no time to ask about his marriage with the daughter of the deputy mayor of the Qing He County. After checking his book, the old man said, "I'm afraid it won't woke out. It is not your time. Your wife now is only three years old, and she will marry you in fourteen years." He turned around, patting the cloth bag, and continued, "see, inside are red strings which will tie up the feet of future couples as soon as they are born. So no matter how far they are apart, or no matter how different in position, they will finally be drawn together by the red string and get married. Young man, your feet have been tied, why take all the trouble to seek your match? " Wei Gu was very disappointed, but he was still curious about his would-be wife's family. The old man said, "She is the daughter of an elderly woman by the name Chen selling vegetables next to your inn. Let me show you." Following the old man, Wei Gu reached a shabby hut, inside which he saw that an old woman blind in one eye was carrying a little girl in her arms, and that both of them were in dirty rags. Shocked by this, Wei Gu begged the old man, "Sir, are there any way to change my marriage?" "I'm afraid not. It is a fate match which no one is able to change." "What if I kill her!" shouted Wei Gu. The old man shook his head, "She is destined to marry you. How can you kill her", and then he disappeared. Wei Gu was so furious from shame that he lost his mind. Running back to his inn, taking his sword, breaking into the shabby hut, Wei Gu stabbed the little girl and then fled in the cries of the old woman. Wei Gu did not dare to go back to his hometown, instead, he joined the army under a false name. Fourteen years later, he was appointed as a high ranking official for gallantry in combat and won recognition from the provincial governor who gave his daughter to him as a wife. She was, in fact, not the real daughter of the governor but his niece. When she was very young, her parents passed away one after the other, and her nanny a half blind old woman raised her until his uncle adopted her. During she living with her nanny, someday a crazy man broke in and stabbed her at the middle of her brows, which did not cause bad wound but made a scar. So she had to use the ornament to cover it. Hearing this, Wei Gu finally believed what the old man had said. He sighed, "Everything is the result of destiny. You cannot fight it." This Chinese story is from "The Other Record of Spirit and Devil Stories", a book written in Tang dynasty which collected many Chinese tales and ghost stories. In the past,this story was often used to prove the power of fate and that marriage comes by destiny，but now rare people really believe that. This story. however,is still told from time to time , and the word of "The Old Man Under the Moon" is also used to refer to anyone who acts as matchmaker between a man and a woman.